"Yes vote 'would consign rest of the UK to permanent Conservative rule'"
It's common to hear claims like this about the effect of Scottish independence on future UK elections. The argument goes that since Scotland has predominantly Labour MPs, then without Scotland the UK would have a permanent Conservative majority in the House of Commons. This reasoning doesn't stand up to past experience. 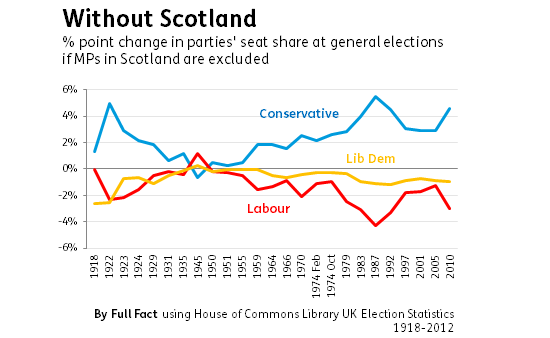 Since 1918, only four UK general election outcomes would have been affected had Scottish MPs been taken out of the equation. Another reason to doubt the prospect of 'permanent' Conservative governments is the possibility that people's voting patters will change. Parties in power often slip in opinion polls after winning an election - in fact a poll 'slump' of some sort is observable after every recent election. While some do increase their ratings again towards the end of their term and secure re-election, this won't always be the case. It's also open to question whether social attitudes would shift in a new political landscape, although it's harder still to measure what effect the party in power has had on attitudes historically. In addition, it's impossible to predict how parties may alter their platforms in response to changing attitudes. The original article stated February 1974 without MPs from Scotland would have been a hung parliament with Labour as the largest party. This should have said a hung parliament with the Conservatives as the largest party, so a fourth election with a different outcome. Sorry for the error and we've corrected the piece to account for this.